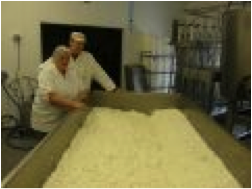 This family dairy enterprise modernised and expanded into specialty cheese production. All raw products came from environmentally-friendly systems, sourced on the farm or the locality. The income base is now broader, with two jobs created. In 1998 the beneficiary added a small-scale dairy processing system to his enterprise, producing cottage cheese, yoghurt and cream. 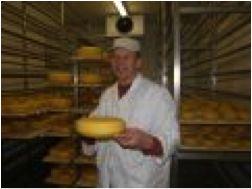 As competition increased and product prices declined he decided in 2008 to expand his processing capacity by producing specialty cheeses aimed at the quality end of the market. The main objectives were to modernise and expand dairy production capacity so as to broaden and provide a more stable income base for this farm and processing business. An important principle was that the raw milk and other ingredients were produced and purchased locally (mostly from the family farm) using environmentally friendly farming methods. Advisory support on this kind of expansion was difficult to source in Estonia, so the farmer took the initiative and visited small-scale Swiss, Swedish and German dairies to become more familiar with production and marketing techniques, to assess the potential benefits and risks and to plan the investment in detail. When funding was secured, equipment was purchased and made functional. Staff training also took place. The investment has indeed helped to broaden the product and income base, and also provided additional employment (2 labour units) for this family-owned farm and food business. In addition to the satisfaction of successfully running their own "farm-to-fork" food business the Nopri family feel their future is now more secure. "When local know-how and professional advice is not readily available, develop and trust your intuition, and backed it up by strong and systematic planning" sais the beneficiary. These days, the market demands greater product choice but in smaller quantities. Skilled labour is still very important in these micro enterprises to give that personal touch to the production process and when marketing from home and other distribution points. Karina village, Misso parish, Võru County.